Scientists have spotted a massive crack running through one of the most prominent glaciers in northwest Greenland. Ice flow at the Petermann Glacier has been speeding up over the past few years, and satellite images now suggest a new iceberg could break free sometime in the near future. Petermann is one of just three glaciers in Greenland that has an ice tongue – a 43-mile floating expanse that stretches into the Petermann Fjord. 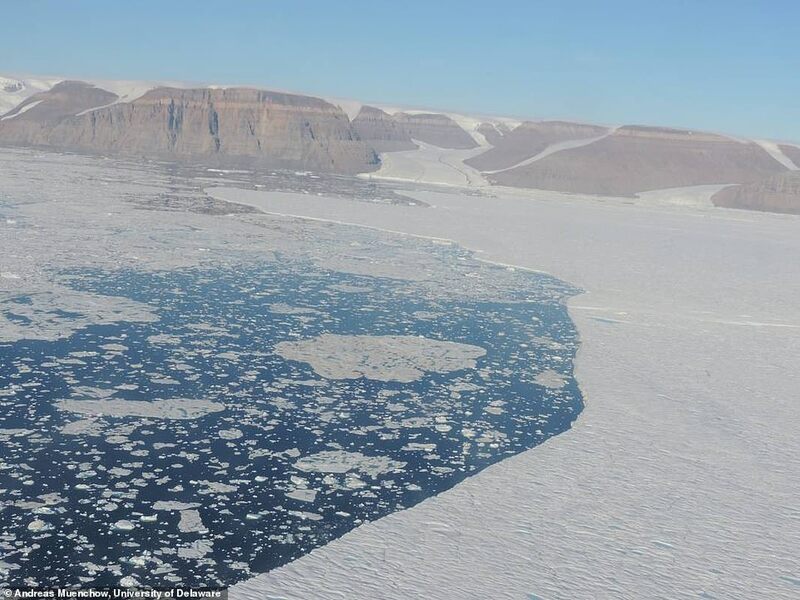 ‘The satellite data shows that Petermann Glacier had a flow speed of roughly 1135 meters per year in the winter of 2016,’ said glaciologist Niklas Neckel, from the Alfred Wegener Institute, Helmholtz Centre for Polar and Marine Research (AWI). According to a new study led by AWI, the recent acceleration was spurred by the loss of a large iceberg back in August 2012. And, according to the models, a similar phenomenon could occur if another piece breaks off. ‘On their way to the sea, the glacier’s ice masses rub along the rock walls that enclose the fjord to the left and the right,’ said lead author, AWI ice modeller Martin Rückamp. ‘If a major iceberg breaks away from the end of the glacier’s tongue, it will reduce the tongue’s overall length, and with it, the route along which the ice masses scrape against the stone.